You’ve found the official website for Topa Topa Lodge #291. Topa Topa serves the Ventura County Council in California. For the latest news, read the posts below. You can comment on posts by registering for an account, click “log in” to the left and then “register.” We will not share your information with anybody. Thursday, March 28, 2019 is the Next Lodge Executive Committee (LEC) Meeting. There is a lot of business to cover and we need all Lodge Officers, Chapter Chiefs, Advisers or their representatives to please attend all this meeting. As always the meeting will start at 7:30 PM in the Scout Center. All LEC meetings are open to all members in the Lodge. See you there! Chapter Chief’s please bring your written Chapter reports and articles for the upcoming Tom Tom. Our home camp, Camp 3 Falls is nestled in the beautiful Lockwood Valley in the NE corner of Ventura County. It’ s never too early to promote Summer Camp. Here is the current promotional flyer, perfect for downloading and charing with your unit and the units in your chapter while promoting Summer Camp. 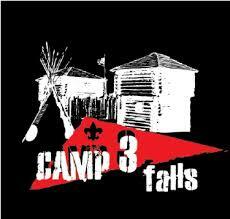 Questions about Camp 3 Falls can be answered at www.campthreefalls.blogspot.com. If you haven’t already started following our feeds on Facebook and Twitter, you can easily find us by clicking the Facebook and Twitter links on the right side of the page. Like us on Facebook and Follow us on Twitter. Post something about your latest Lodge experiences on our page! Upload photos and videos. We want to share your thoughts and experiences with everyone in the Lodge. For now, we’ll not be following any one on Twitter for security purposes, but we will be posting information about the Lodge and upcoming events and happenings from time to time. Mostly, let us know what you think, and any comments by posting here. You will need a login to post comments, and all comments must be approved before they are posted. Congratulations on your election to the Order of the Arrow. 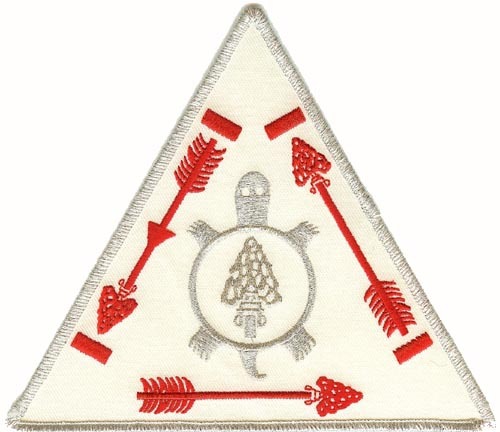 Now you will need to complete an Ordeal weekend to become a member of the OA. The paperwork you received at the Camporee contains all the information you need. You are encouraged to attend the upcoming Pre-Ordeal orientation meeting in your district. If you don’t have that meeting information, please click the Inquiry link to the left. Be sure to include your troop number or district in the message along with a way to contact you. If you have lost your papers from the weekend, the information is available on our downloads page. The Ordeal weekends are at Camp Three Falls, they are from Friday evening thru Sunday morning (you must attend the entire weekend to be inducted). 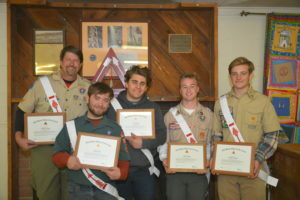 Five of your brothers completed their Vigil weekend at Camp Three Falls. 33 Lodge Vigil Honor members attended the weekend to support the new candidates. Thanks especially to the cook staff for great food, and to Vigil Chief Tyler K. for a great event. The 2017 Topa Topa Vigil class is: William Parker, David L. Cody A., Nolan D., Brandon C.